Protestors oppose cuts to healthcare coverage for city of Detroit retirees. The city of Detroit and unions have reached a tentative agreement to limit planned cuts to retiree health care coverage, potentially resolving one of the most expensive issues in the city's bankruptcy case. Terms of the tentative deal were not available Friday. Bill Nowling, spokesman for Emergency Manager Kevyn Orr, who is overseeing the city's finances during the bankruptcy, called it an "agreement in principal," and said details would be released soon. "We're happy we're able to reach any agreement short of protracted litigation," Nowling said. "Things are starting to move in the bankruptcy case and we think it's moving in a positive way." The cost of providing health care coverage for retirees accounted for about half of the $11.5 billion in unsecured debt that the city cited in its July 18 bankruptcy filing. The plan presented by Orr calls for using the bankruptcy court process to slash those debts to $2 billion. The tentative deal only covers the cost of health care, not pension benefits, which also could be cut in the city's bankruptcy reorganization. Pension benefits have some protections under the Michigan state constitution, but it is not clear whether those protections mean anything in the bankruptcy court process. 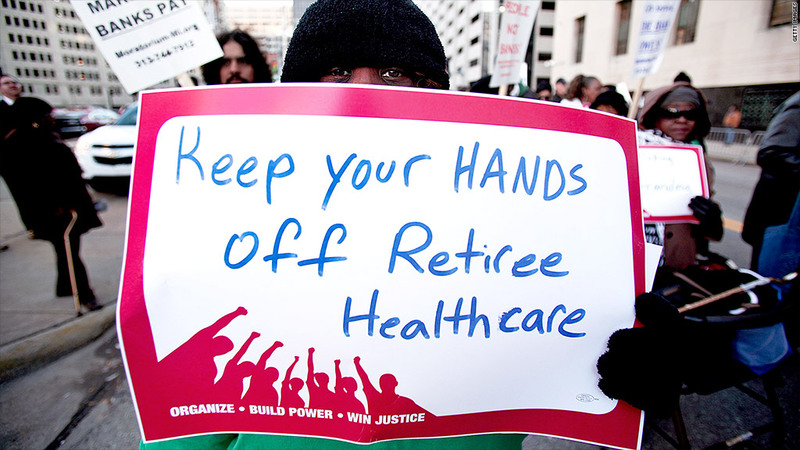 The retiree health care coverage has even fewer legal protections. The city has provided health care coverage to retirees who are not yet eligible for Medicare that is similar to what active employees get. It has also offered a supplemental Medicare policy. In October, the city announced plans to end health care coverage for retirees not yet eligible for Medicare. Instead, those retirees would get a $125-a-month stipend to buy coverage on their own, either through the Obamacare exchanges or a current employer. But first because of problems with the Obamacare web sites, and then at the request of mediators, the city delayed cutting those benefits. They were due to take effect March 1. There had been a hearing in bankruptcy court set for Feb 3, to hear a legal challenge to these benefit cuts. But on Friday, mediators in the case announced the two sides had reached an agreement and that the legal challenge would be dropped. Details of the agreement still need to be worked out, according to Nowling. And it will need to be approved by bankruptcy court judge Steven Rhodes. Rhodes has already rejected a previous agreement between Orr and two major banks that hold city debt, the Bank of America (BAC) and UBS (UBS). That agreement was also backed by mediators, so it's not certain that Rhodes will approve the deal. Spokespeople for the city's unions were not available for comment Friday.